Amsterdam, 03 October: HDFC Bank Ltd., one of India’s premier banks, providing innovative products and smart banking solutions to over 37 million customers across India, has selected Backbase, the omni-channel digital banking market leader, to deliver its new digital omni-channel banking platform, running both its online and mobile banking apps. After a competitive evaluation process, Backbase has been selected to deliver HDFC Bank’s new digital omni-channel banking platform and mobile apps in India. HDFC Bank has over 37 million customers with a distribution network of 4,541 branches and 12,013 ATMs across India. The new omni-channel banking architecture – including mobile apps, empowered by Backbase, will enable a seamless customer experience across all digital touch points. 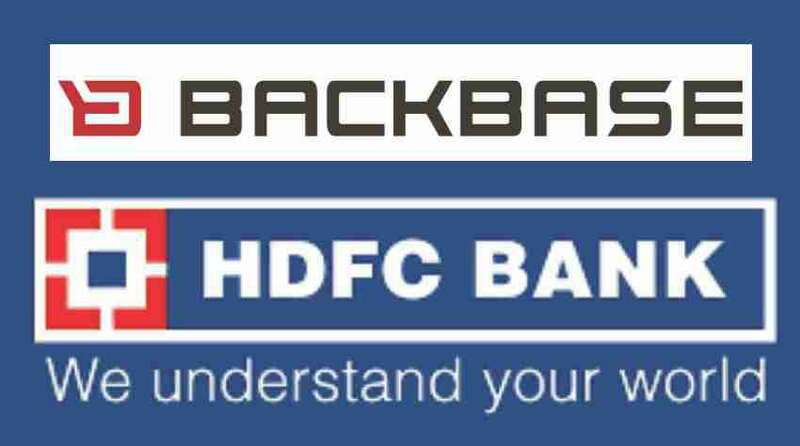 Backbase will play a key role in delivering HDFC Bank’s next generation of banking architecture. Thus platforms like the mobile banking app, digital banking portal, and web site will run on the Backbase platform. The first phase will be re-architecturing HDFC Bank’s technology stack with a true omni-channel platform approach. Backbase will combine HFDC Bank’s existing core banking and back-end applications with its modern digital banking platform that orchestrates the digital banking journey of the customer across multiple touchpoints. At the same time – by utilising Backbase’s experience manager capabilities – the non-technical digital business teams within the bank will be able to create new products and efficiently run cross – and upsell sales campaigns – all without any IT support. “We see a strong momentum for digital transformation projects in emerging markets – and with HDFC Bank Backbase has built its reputation and marked its footprint in the Indian banking landscape when it comes to next generation banking,” said Jouk Pleiter, CEO and Co-Founder of Backbase, “HDFC Bank has a very strong track record in leveraging technology to make their business highly competitive. In that context we’re very excited to partner with HDFC Bank to bring their retail digital banking operations to the next level, and strengthen their digital presence in India by supporting their customers with a true omni-channel banking platform and a seamless customer experience”. Backbase is on a mission to empower financial institutions to accelerate their digital transformation and effectively compete in a digital-first world. We are proud to be the creators of the Backbase Omni-Channel Banking Platform, a state-of-the-art digital banking software solution that unifies data and functionality from traditional core systems and new fintech players into a seamless digital customer experience. We give financials the speed and flexibility to create and manage seamless customer experiences across any device, and deliver measurable business results. We believe that superior digital experiences are essential to stay relevant, and our software enables financials to rapidly grow their digital business. More than 70 large financials around the world have standardized on the Backbase platform to streamline their digital self-service and online sales operations across all digital touchpoints. Our customer base includes Al Rajhi Bank, ABN AMRO, Barclays, CheBanca!, Credit Suisse, Fidelity, Hapoalim, Hiscox, ING, KeyBank, Legal & General, NBAD, OTP, PZU, PostFinance, Societe Generale de Banque au Liban and Westpac. Industry analysts Gartner, Forrester and Ovum recognize Backbase as an industry leader in terms of omni-channel banking platform capabilities, and award the company high marks for its deep focus on customer experience management and unparalleled speed of implementation. Forrester named us a leader in the Forrester Wave for Omni-Channel Banking. Backbase was founded in 2003, is privately funded, with headquarters in Amsterdam (HQ Global) and Atlanta (HQ Americas) and regional operations in London, Mumbai and Singapore. Promoted in 1995 by Housing Development Finance Corporation (HDFC), India’s leading housing finance company, HDFC Bank is one of India’s premier banks providing a wide range of financial products and services to its 37 million customers across hundreds of Indian cities using multiple distribution channels including a pan-India network of branches, ATMs, phone banking, net banking and mobile banking. Within a relatively short span of time, the bank has emerged as a leading player in retail banking, wholesale banking, and treasury operations, its three principal business segments. The bank’s competitive strength clearly lies in the use of technology and the ability to deliver world-class service with rapid response time. Over the last 20 years, the bank has successfully gained market share in its target customer franchises while maintaining healthy profitability and asset quality. As of June 30, 2016, the Bank had a distribution network with 4,541 branches and 12,013 ATMs in 2,587 cities/towns. For the quarter ended June 30, 2016, the Bank’s total income was INR 188.62 billion (`18862.6 crore) as against INR 155.70 billion (`15570.1 crore) for the quarter ended March 31, 2015. Net revenues (net interest income plus other income) were INR 103.19 billion (`10319.2 crore) for the quarter ended March 31, 2016, as against INR 85.76 billion (`8576.9 crore) for the corresponding quarter of the previous year. Net Profit for the quarter ended March 31, 2016, was INR 33.74 billion (`3,374.2 crore), up by 20.2% over the corresponding quarter ended March 31, 2015.Total income for the year ended March 31, 2016, was INR 709.73 billion (`70973.2 crore).